I Have A New Site Called Chocolates and Crockpots! Come Check It Out! 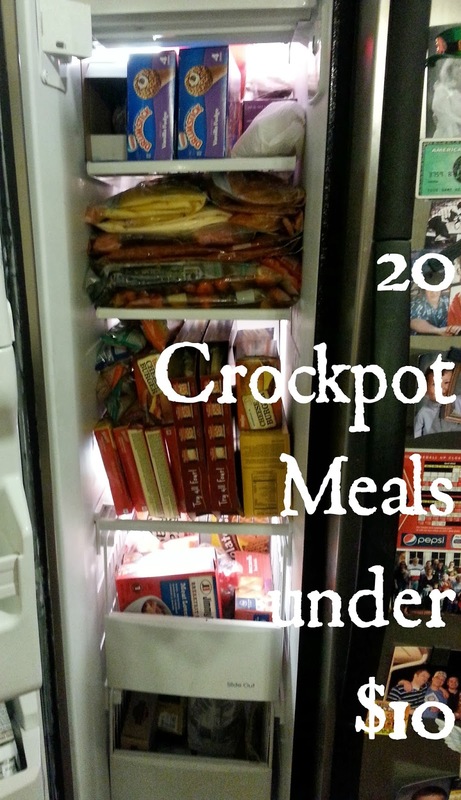 : 20 Crockpot meals under $10! Happy Saturday to you all! Hope your weekend is full of rest and relaxation because the holidays are now in full swing! We have the pleasure of hosting pretty much my husband's entire family tomorrow for an early Thanksgiving. That means 33 people will be running around here and there's so much to do! Luckily for me I have the world's best mother-in-law and she will be here all weekend to help...and the best part is I actually want her here! I truly feel bad for those who don't have as wonderful a relationship with their in-laws as I do. I am very blessed and I know it. I 100% stand by each and every one of these recipes. I have successfully made and cooked and enjoyed all of these and the instructions that I give are exactly what I did. Each meal is made for 2 adults for dinner and always enough for at least one lunch the next day. If you have a small family use the recipes as is, if you have a larger family just try doubling the meat. I know a lot of people say to thaw out the meals 24 hours ahead of time, I don't. They say to move the meal from the freezer to the fridge the night before...I don't. They say not to add chicken stock or shredded cheese, or things like that...I do. I take my bags out in the morning and run hot water over them if I need to in order to make sure everything fits in the pot. The hot water helps make the contents in the bag break into pieces and fit in the crock pot better. I never have a problem with cooking any of these this way and I want to share them with you because they are so.darn.easy. So go grab your crock pot, and let's get started! For everything I needed I only spent $197 and got 20 meals out of it (not including leftovers). It was awesome. I shopped my local Meijer and used their mperks rewards to help save here and there. If you shop at Meijer and don't use mperks you're cheating yourself. Here's everything I got! I actually group together each meal's ingredients as I unpack so it's easy to grab and go when I get to the part where all I have to do is dump everything in. I know it doesn't look like a lot, but that's not including all the meat and all the veggies. You can find the full grocery list at the bottom of this post. The first step is labeling all of your freezer bags with the name of the meal, the cook time and any special instructions. I use gallon size bags. Next you'll want to chop all the veggies. I portion things out as I go so I know how much I need in each bag. I chopped, & chopped, & chopped, & kept chopping even when my hand felt like it was going to fall off. You'll notice I don't have any onions. I hate onions. Pretty much all of these recipes could have onion added, so feel free if you're an onion lover. 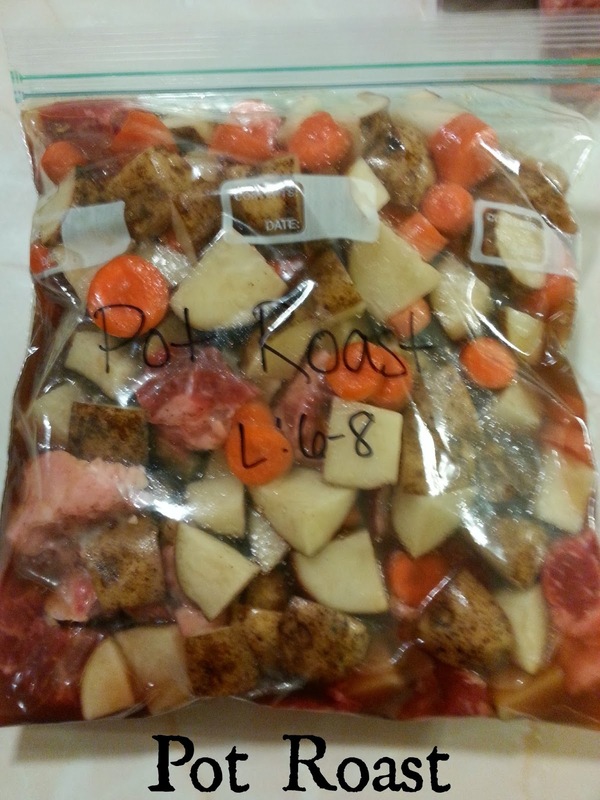 Once you have all your veggies chopped & your bags labeled, you'll want to divide up your meat. You'll need to cook the ground beef and let it cool. Meat goes in the bags first. Once that's done you go through each recipe & pour in whatever goes with it. Seal it up, lay it flat for easier storage & you're done. Buwahaha I make it sound so darn easy. It's not actually "hard" but it is time consuming. I definitely wear sweat pants, a ratty old t-shirt & comfy shoes when I do this. Split all ingredients in half & place in bags. Freeze. 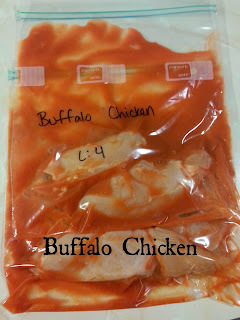 Day of cooking grab from freezer, pour in crock pot & cook on low 4-5 hrs. Remove chicken, shred & pour sauce from crock pot over it. We serve with rice. 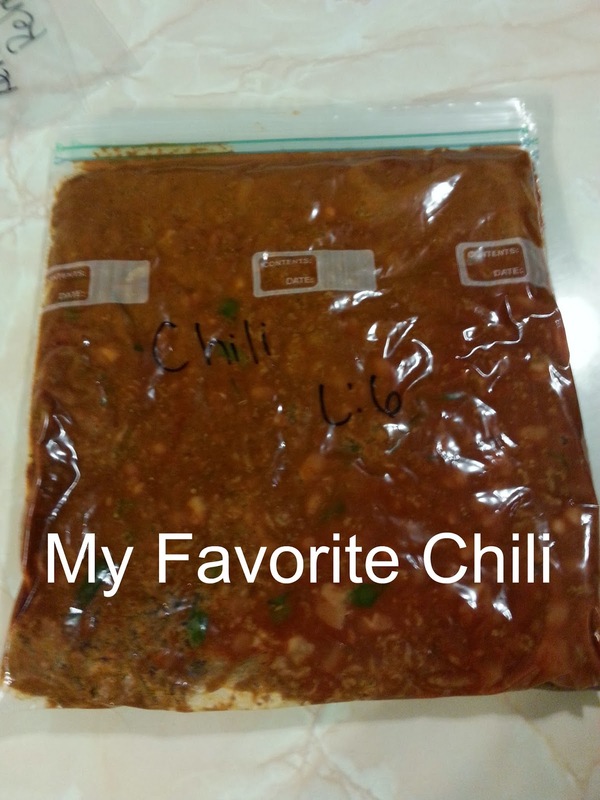 So I can't disclose my Chili recipe entirely because it is a family secret, but I will give you most of it :) If you have a recipe you love, make it and freeze it. Brown ground beef, drain & cool. Split all ingredients in half & place in bags. Freeze. Day of cook on high 3-4 hrs or low 6-8 hrs. We eat with cornbread, sour cream & cheese. Split all ingredients in half and place in bags. Freeze. Day of cooking grab from freezer, spray down crock pot with PAM really well, pour all contents into crock pot and cook on low 4-5 hrs, checking at 4 hours. Don't stir until ready to serve. We serve with broccoli and sub shredded chicken sometimes. Split all ingredients in half and place in bags. Freeze. 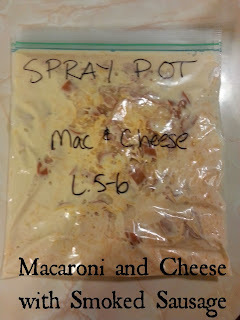 Day of cooking grab from freezer, pour all contents into crock pot and cook on high 3-4 hours or low 6-8 hours. We serve with angel hair pasta or mashed potatoes. Brown ground beef, drain & cool. Split all ingredients in half & place in bags. Freeze. 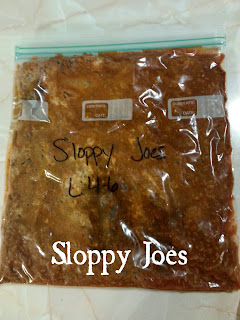 Day of cooking grab from freezer, pour all contents into crock pot & cook low 4-6 hours. We serve with rolls and macaroni and cheese. Split ingredients listed above in half (except for rolls) and place in bags. Freeze. Day of cooking grab from freezer, pour all contents into crock pot and cook on low 4-6 hrs. Remove chicken and shred. 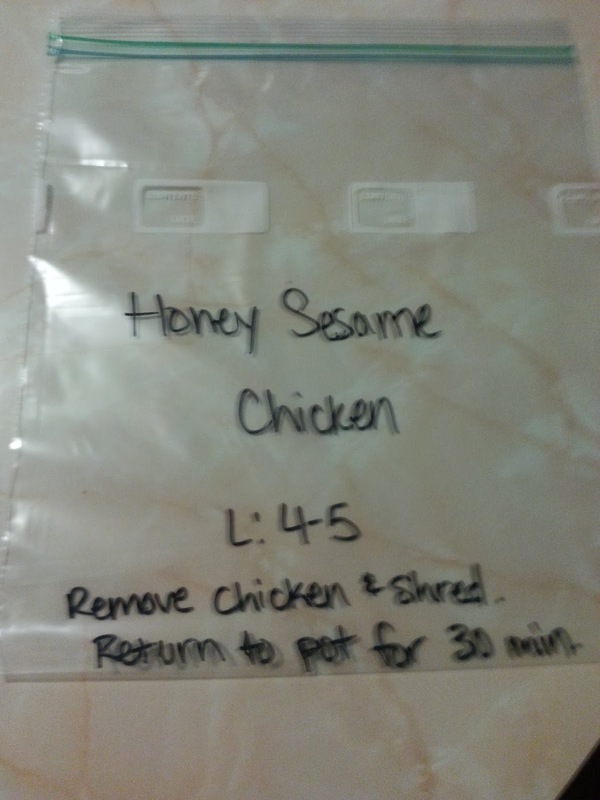 Return chicken to pot and mix ingredients listed below in a small bowl. Mix together the chicken and dressing mix. Split rolls and add chicken mixture. Split ingredients in half (except barbeque) and place in bags. Freeze. Day of cooking grab from freezer, pour contents into crock pot and cook on low 6-8 hours. Remove and shred. Throw out sauce in pot and return meat. Add your favorite bottle of barbecue sauce to pot and stir. Serve. We serve on sesame seed buns with macaroni and cheese. What are your favorite crock pot recipes? I'm always looking for new meals to try. Hope you love these recipes as much as I do! Excellent idea and amazing execution! I've seen this done on blogs before but this my favorite and has inspired me to try it! Would love the shopping list :-) also looking forward to broccili and cheddar recipe! Look for it this Friday :) Happy Thanksgiving! Hi! I'm just popping over from the DIY Sunday Showcase Link Party. Making a month's freezable meals which ends up giving lots of time later is a fabulous idea! I love it! Thanks for posting it. 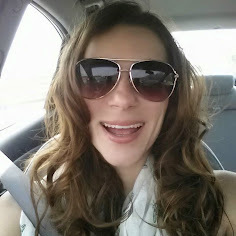 I have pinned, liked and tweeted, and g+-ed. I would love it if you would drop by my site at http://www.kneadedcreations.com for a short visit! I will look forward to seeing you there! Deb @ Kneaded Creations. I love crock out meals!! These all look so good! I would love if you would come linkup with me today! Thanks for the invite! Linked up! Happy Thanksgiving! Great easy recipes - I just made about 4 of them, thanks! 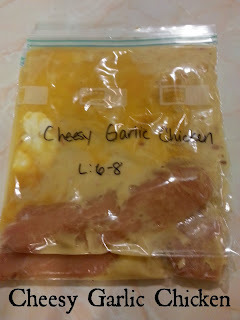 I added more chicken to The chicken cheesy garlic one though - 4 medium sized boneless skinless breasts instead of 2. Thanks again for sharing. Quick question. How much does each make. I'm a family of 6, how much more of the recipes would you add to? Double, triple? Love the idea of it. Hey Christian! Each meal feeds my husband and I plenty with enough left over for at least one lunch. I'd say if most of your family is kiddos try doubling just the meat. If most of your family is teenagers that eat everything in sight, double the whole recipe. Let me know how it works out! Thanks for linking to What'd You Do This Weekend. Have a wonderful Thanksgiving. I trained my onion hating kids by using the dehydrated ones which disintegrate when cooked. The flavor is there but not the onion itself. We then graduated to super small dice and are up to decenct sized slices. 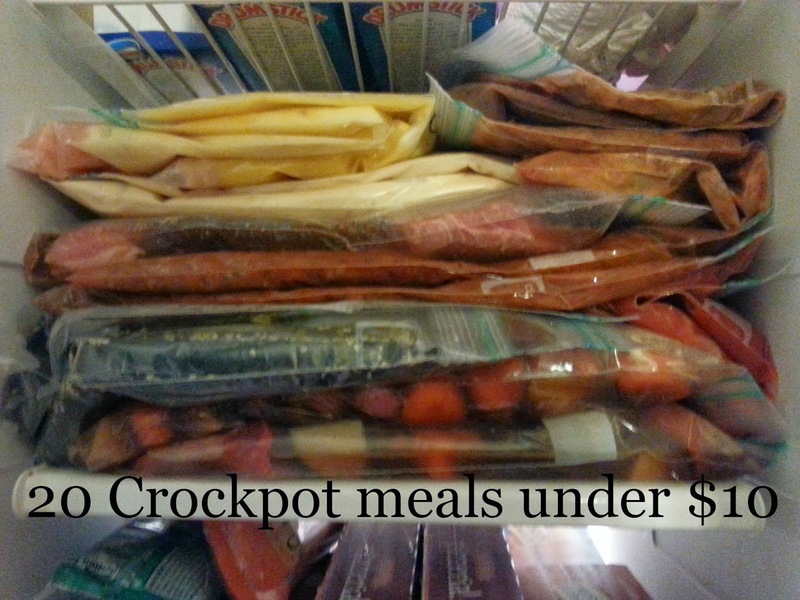 I am not sure what I love more about this post - love crockpot meals and I love that your freezer is so organized! Thank you for sharing this at the Home for the Holidays link Party. I hope you continue to bring more of your wonderful recipes, the party continues for a month! How many servings does each meal make? Sounds like a pretty great deal! Thanks for sharing at the Foodies and Crafties Soiree! Each meal fills my husband and I's bellies for dinner and leaves enough leftover for at least one of us to have lunch the next day. Hope this helps! I should have read this before shopping. Either way LOVE the motivation. I purchased your list minus what we already had. Thing is we have 4 kiddos. 2 12 year old boys, one 14 year old girl and a 6 year old girl. They are demanding and I am pretty sure going to eat us out of house and home. Uh yea....this post ROCKS MY SOCKS!! Thanks for sharing, I WILL be doing this!!! Do you cook any of the chicken before freezing? Nope! The only thing I cook ahead of time is any recipe that has ground beef. So like the chili and the sloppy joes. Hope this helps! This is a wonderful idea. Thanks for sharing on Wake Up Wednesdays! Happy TGD & HUGS! Thanks so much for sharing! This is great! Would love a master shopping list. I love that these are for 2 people. That helps me since it is just me and the husband. Hey Consie! Planning on having the master list up with the broccoli cheddar soup on Friday. Happy Thanksgiving! Thanks Jamie! Happy Thanksgiving to you are yours too! Already pinned! I've been looking for freezer crockpot recipes that my picky eater boyfriend would eat and these definitely fit that bill. And saving money is a gimme. If it's in your area, you may want to try purchasing bulk meats with Zaycon Foods https://zayconfoods.com/refer/zf43636. Thanks for sharing. Thanks for the tip Michelle! I'll have to check that out. This looks like something I might be able to manage. I'm always looking at blogs with organized people & freezer meals that are just too much, this seems manageable the way you explain it. I'd love the soup & shopping list. I have a couple questions. My husband retired early a couple years ago & his dream was winters in Florida & being able to play golf in winter. He worked very hard to for many years to be able to do this. This year for the first time it's just the 2 of us down here ( my youngest son, who has developmental disabilities was with us the first 2 winters) this yr. he's home in Maine in a day program, volunteering etc. he has his oldest brother & case worker helping out. I want to try this because there are many nights I really don't feel like cooking. I have fibromyalgia & my energy level varies a lot. This could help. My husband convinced me not to bring my crockpot. I need to get one down here, until then do you have suggestions for time & temp if I try heating in Dutch oven in a low temp. oven? I may just need to experiment. 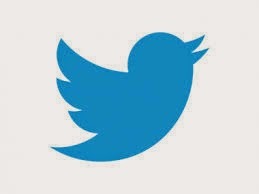 Also I'd love to subscribe to your site, I found it through the link party. Is it possible to subscribe by email? Thanks for a great blog post. Hmm...I'm not too sure about the dutch oven. I've only ever cooked soup in mine. I'd say the pot roast, chili, sloppy joes and pulled pork would be great in a dutch oven. Give each one at least a few hours on low and then use your best judgment after that. I'm not too familiar with how fast chicken cooks, but I don't see why it wouldn't work :) The macaroni and cheese could be cooked in the oven and frozen in a disposable pan. Then all you'd have to do is bake it and toss the dishes. I'd say it'll be a trial and error with timing on most of them until you get your crock pot back. Hope this helps. Let me know how it turns out. I love all of these! I am always searching for more and more crockpot recipes, and you just gave out a bunch! Followed and pinned, and wanted to stop by to let you know I am featuring this post later tonight on What'd You Do This Weekend. Thanks for sharing, and have a great night! Just wanted to stop by to let you know that I chose to feature your recipe (that you linked up last week) for Tasty Tuesday this week! Thanks for stopping by Tasty Tuesday and hope to see you there again soon!! I leave for work early in the morning and don't come back until 10 hours later. Do you think these recipes could be cooked in a crock pot on low for 10 hours and be okay? Thanks for posting these, they're amazing! So I had to think about this for a minute. I'm not sure what would happen with a ten hour window. 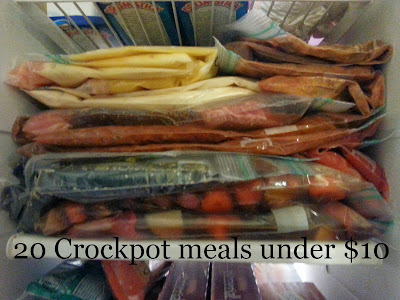 Most of my meals are ready to go at about 7, but all crock pots are different. An idea I had was to use a plug in timer...like the ones you use for Christmas trees or outdoor lights. You could set the timer to start a couple hours after you leave and that way your crock pot wouldn't turn on until after you've left. Does that make sense? Let me know if you try it and it works. Hope this helps! Could you also please post your grocery list? It's at the bottom. Hope you enjoy! The amount of meat that you put for two bags, does that mean 2 chicken breast per bag or one each? So when it says two chicken breasts that means one breast per bag. I usually cut the breast in half and put two halves in each bag. 2 halves=1 chicken breast...one breast=one bag :) Hope I didn't just completely confuse you! I have started doing this freezer meal thing and I love it! Thank you so much for posting all these recipes. I am now following you on Pinterest! I am definitely making the broccoli soup for dinner tonight! cook noodles - put in crock with all other ingredients and cook on high for and hour then cook on low for another 1 hour. 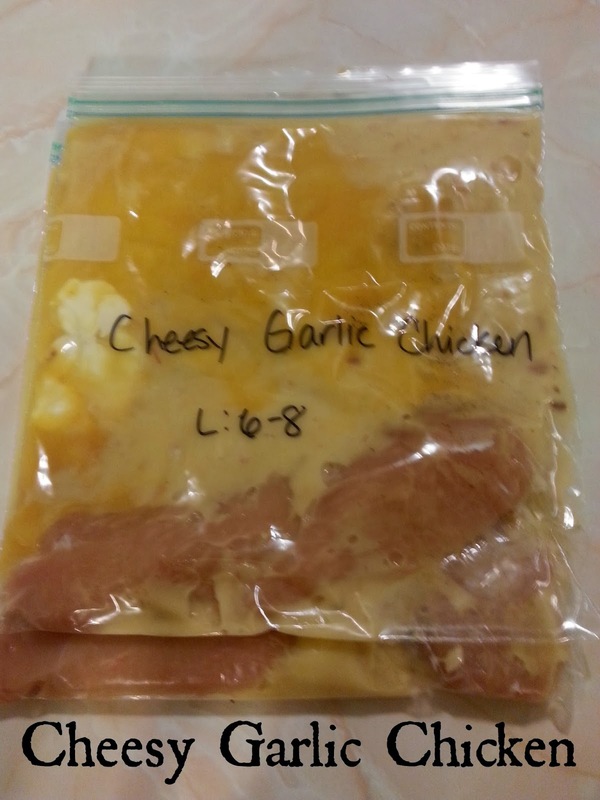 in your Cheesy Garlic Chicken it looks like you have 2 chicken breasts. do you make this recipe with 2 or just 1? thanks! There's still only one in there. I cut the breast in half to help make it easier to cook and shred. Let me know if you have any more questions! Hope you enjoy! Can not wait to try some of these. I was so excited to see you don't put onion in any of them! My hubby can't eat onions (strangely enough he can have onion powder though) and it's hard to find recipes that don't call for onion. Thanks so much for sharing these. I am also an onion hater, so I was thrilled to find your recipes! It's so hard to find these kinds of recipes that don't feature the onion. I will be trying all of these soon! These look great! How big is your crock pot? I got a new 5 quart pot For Christmas that says it should be at least half full for best results. It doesn't look like some of these smaller recipes will fill it up that much with just the 2 to 3 servings, which I would prefer. My boyfriend doesn't like chicken leftovers, so I don't want to double the recipe if I don't have to. I just worry that I'll come home after 8 hours to burnt food if its not full enough. Any suggestions?? Hey Brandy! I suggest first "getting to know" your slow cooker. Pour 2 qts water in the cooker, cover and set on low for 8 hrs. Lift the lid and immediately check the water temp. If it's 185, you're good. If it's higher, your cooker works faster and cook times should be shortened. My crock is a 4 qt. I've made all of these several times, without it being a majority full. If it's 6-8hrs my foods usually done at 7. For 4-5 hrs, it's done at 4 1/2. Remember, I don't thaw mine out the night before, I just throw it all in frozen. If you don't want to overcook I suggest not packing away your automatic timer you used during the holidays (or go getting one) and using that to make your crock start an hour or so after you leave. Let me know if you have any more questions. Hope this helps! I bet you are so happy to have so many meals done! So handy on the busy or lazy days! My hand hurts from writing down all these recipes (and sorry for spamming you with comments)! I think I have a lot of the items in your recipes though, so I could probably make all these meals for very cheap! I'll explore other meals eventually, but both your posts are a great start for me! Great post! I had a question about the Macaroni and Cheese- do you add the noodles with all the other ingredients? If yes, are they cooked or uncooked? Thanks and have a great day! Great question! I know it doesn't sound like it would work, but I put the pasta in uncooked and freeze it no problem. It still cooks up perfect and isn't affected by freezing it. Hope this helps! Question: So many of us don't get home between the 6-8 hours after the crock pot is started. I get home 10 hours after I could start one. Any solutions to this, or am I out of luck doing crock pot ideas like this? They sound great, but I don't intend to put effort in for it to be burned when I get home. Thanks! I've been asked this question a lot. My advice is to use an outlet timer, like the ones used for Christmas lights. Plug your crock pot into the timer and set it to start a few hours after you leave. That way it won't sit and cook too long and can still be ready when you get home. Hope this helps. Feel free to ask me any other questions you have! Ok, so we are a family of 6, theres 2 adults and 4 little ones under the age of 9....do just double the meat or the entire recipe? And if it is just the meat will there be enough seasoning and what not to accomodate the extra meat? Thanks, love the ideas! Ya know it's really a personal preference. I suggest to double the meat, only because we always have a ton of the "extras" (potatoes, pasta, peppers) left over but not a ton of meat. Feel free to double everything if your family likes a lot of flavor. If your little ones don't necessarily like things too spicy, don't double those seasonings. But say for the pot roast and pulled pork you could easily double everything without making the flavor overwhelming. Hope this helps. Let me know if you have any other questions! I can't wait to try these! What size crock pot do you use? I have a 4 1/2 quart pot. Most of these recipes barely fill it half way and still cook up great. Mmm... dinner was so good! We made buffalo chicken but I thought it would be great on tortillas w/ sour cream, extra hot sauce (if desired) and lettuce! Mmm what a great combination! Mix soups and water together, layer in cube steak and soup in crock pot salt and pepper to taste. Cook on low for 6-8 hrs. This. is. amazing!!! Thank you for sharing!!! I've always wanted to do make ahead crockpot meals. 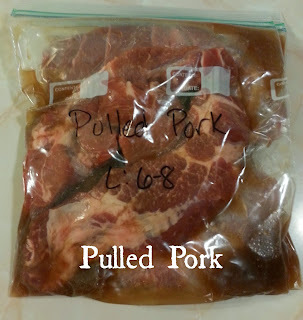 How do you get the frozen meal out of the bag and in the crockpot? Most of the time, everything sticks to the bag and it's a nightmare! Am I missing an important step? Thanks for the help and great ideas. Great question! I usually run my bags under super hot water for a minute or so and by then it's easy to bend. It breaks apart easily when I bend the bag and fits easier. Sometimes I have to shove the lid on, but it always works out :) If you notice a ton of seasonings left in the bag try throwing in a few Tbsp of water and swooshing it around and pouring that into the pot. If the meat is sticking, it might be the kind of bag? I'm not sure why that would happen. If it's the sauces, try putting the bag on a cutting board over the pot and running a rolling pin down the bag. All the stuff dumps into the pot. That's what I do. Hope this helps! On the Mac n Cheese recipe, do you cook the noodles before freezing? or do you add them dry and let them cook in the crock pot? I add my noodles dry and don't cook them ahead of time. It makes putting the pasta meals together so much faster. Hope this helps! 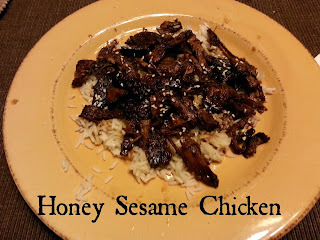 I featured your recipes in my blog! Hi- these are great! I'm putting some of them together right now. I was wondering if you cook both bags for each recipe or just one at a time?? We just cook one bag at a time. If you happen to have a larger group you might want to cook two. Usually one bag is enough for my Hub and myself with just enough left for lunch the next day. Hope this helps! I love your recipes and I use my crockpot all the time! I just had one small problem, I don't know if it's ever happened to you or some of your readers. I made the crockpot chili last night (after it being frozen for about 1 week) and it came out so mushy! It had my boyfriend put it in for 8 hours and I could check it when I got home at about the 6 hour point. I had to take it immediately out when I got home because it was literally just about baby food! Any suggestions on what to do for the next try would be great! Thanks. How long will these meals last in the freezer? Not too sure how long, but I've had some of mine for two months and they still taste great! Hi! I was wondering if you cook and then freeze the elbows for the mac n cheese ordo they just cook in the crockpot? Nope, just toss the uncooked noodles into the freezer bags and they still cook up great! Tried the cheesey garlic chicken tonight. It smelled AMAZING when I came home from work. I loved it! Such a simple recipe but a wonderful flavor. The chicken just fell apart, no knife needed! Even my wife, afraid to try new food,picky eater, loved it! It was so good I saved the extra sauce and angel hair for a work lunch. Delicious! Thank you! I have a question....how many servings is each meal? What I make for dinner my husband takes to work for lunch the next day so I am wnderin if there is leftovers. I split each recipe in half since it's just the hub and I right now. There's always plenty for both of us with enough extra for lunch the next day. 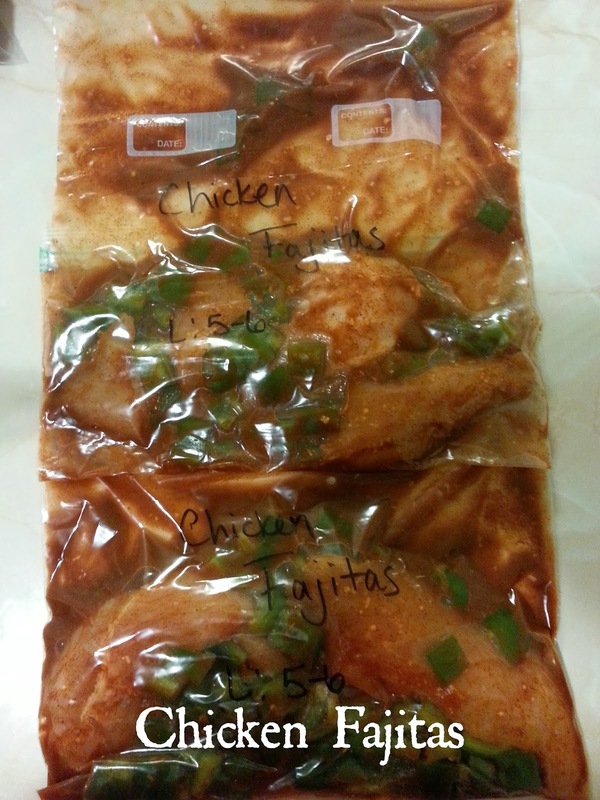 Do you thaw meals out in fridge the night before cooking them??? I only see 9 it says 20 meals I found the shopping list. Can you please help me with this. Thanks! Hey! Each recipe makes two meals and the final two meals are the Broccoli Cheddar Soup I link up to with the grocery list. Hope this helps! Hi, What size hot sauce should we use for the buffalo chicken? Hey Dotty! They're all here. If you read the directions, it says to split each recipe into two bags. 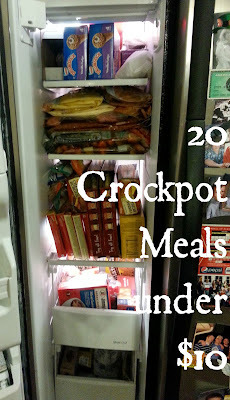 So 10 recipes multiplied by 2 makes 20 :) However, you can go to this post and see several other amazing crock pot meals. 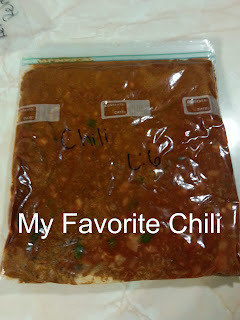 http://organizerbyday.blogspot.com/2014/01/20-crockpot-meals-each-under-7_8.html Each serving makes enough for me and my husband with enough left over for lunch the next day. 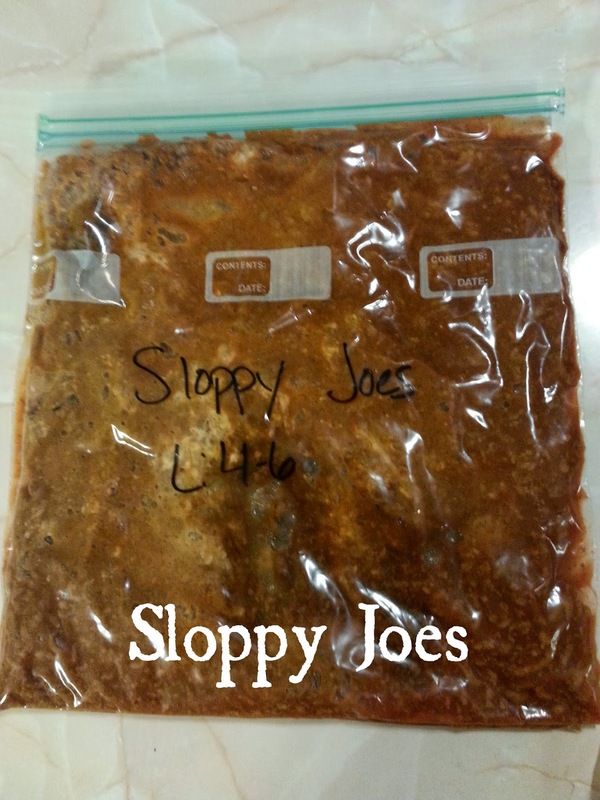 I've heard from numerous readers that each recipe split up still feeds families of four. Hope this helps! Can you put them in the crock pot right out of the freezer? Or do you thaw them the day before? Thanks for all the idea!!! You can do either really! Sometimes I thaw them out the night before, but usually just put the whole bag in frozen. If it won't fit, I keep the bag closed and run it under hot water to break up the ingredients inside, open it and put the broken pieces in the crock pot. Hope that helps! Great question! What you could try to do is melt shredded cheese, milk and flour together to get a thick cheese sauce. Use that and see how it works. Hope that helps! Can I put the meals into the crock pot fresh or do theyneed have to be frozen first? Go ahead and throw them in fresh! If you can check the cook time when there's about an hour to go. So if it says "low 6-8 hours" check it at the 6 hour mark to make sure it isn't ready yet. They should all still turn out great! When it says "makes 2" is that two separate meals? Yep! Well it actually means it makes two separate meals and makes enough for two people. Hope that helps! I'm about to start teaching (my first year) and finding time to make dinner was stressing me out until I found your post. I now am only stressing about classroom management and meeting parents. Thank you so much!!!!!!!!! Thank you so much for this! I am just in the middle of making the bags and I'm kind of confused... Does "split all ingredients in half" mean I'm getting two meals both for two people? So it serves 2 per bag? 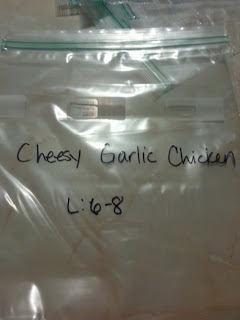 I'm on the cheesy garlic and that would mean my husband and I would split one chicken breast...? Hey there! Yes, you are right that each recipe will provide two separate meals for two people. Each bag serves two people. When it comes to the cheesy garlic chicken, once we add on the mashed potatoes and angel hair pasta we have plenty of food. The chicken comes out shredded and has always been enough for us. Feel free to throw in extra chicken if you want, though! Cook time should still be the same. Hope this helps! One meal we do in the crock pot is meat balls, potatoes and carrots. Very tasty. We currently have a bag of meatballs that we made up last time we bought hamburger. 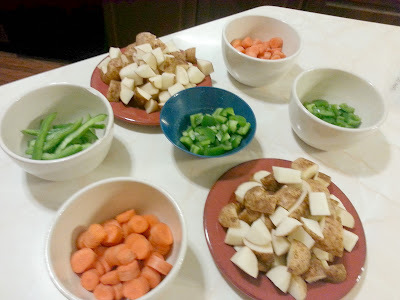 Now all we have to do is peel and cut the vegies (quarter the potatoes) and put in the meatballs. Fill the crock with water and let the vegetables and meatballs cook all day. When we get home from church or work we have a meal ready to eat. Wow! I love that you American gals are just so organised! I am going to print them off and make sure I use them...I love the smell when I come in from the cold, plus knowing dinner will be ready immediately! With love and Blessings, all the way from England!